Our eyes are biological cameras, complete with a deformable lens to focus light, an adjustable iris to control the exposure, and a retina that acts like a digital sensor to record the focused image. It is filled with amazing refinements, such as a layer of dark black cells behind the retina that reduce reflection and keep the image sharp. 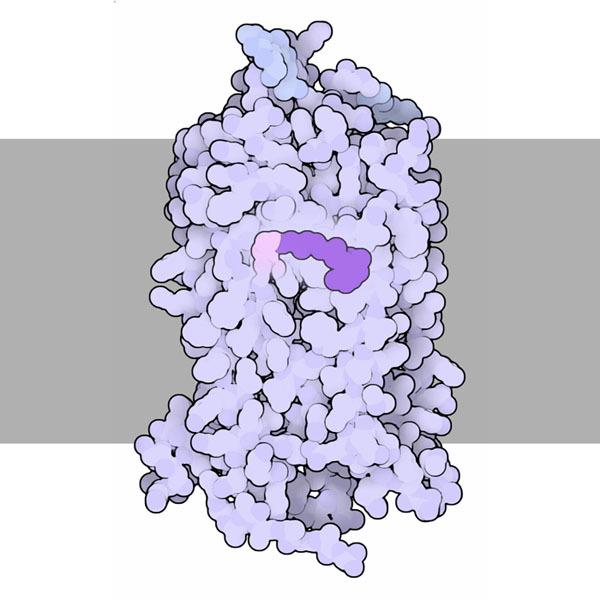 Rhodopsin, shown here from PDB entry 1f88 , plays the central role in this camera: it is the molecule that senses light. It is composed of a small light-sensitive molecule of retinal, bound inside the protein opsin. When retinal absorbs a photon, it changes shape, with one bond flipping from a bent (cis) conformation to an extended (trans) conformation. This tiny molecular signal is then captured by the surrounding opsin protein, and used to launch a signal through a G-protein signaling network, which amplifies the signal and ultimately leads to a nerve signal to the brain. Rhodopsin, with retinal highlighted in purple and the membrane shown schematically in gray. Our eyes are amazingly sensitive sensors of light. Our most sensitive retinal cells, rod cells, can be triggered by a single photon of light. These same cells have a hundred million rhodopsin molecules packed into stacks of membranes, so they can also adapt from the dimmest light to illumination hundreds of times brighter. In addition, our sensory machinery is highly efficient. When retinal is free in solution, it will flip from cis to trans about 1/3 of the time when it absorbs a photon. Opsin, however, grips retinal and holds it in a distorted state, making it easier to flip. So, it is twice as efficient as free retinal, flipping from cis to trans about 2/3 of the times it encounters a photon. Opsin is very similar to other G-protein-linked receptors, such as the adrenaline receptor--so similar that it is thought that they all evolved from a single ancient receptor protein. GPCR proteins are composed of a characteristic folding of seven alpha helices that cross through the membrane, connected by short loops (you can see this in the Jmol below). Opsin captures retinal using a lysine amino acid that is buried deep inside the protein. The lysine forms a covalent bond with retinal, holding it in position and ensuring that the light-sensitive change in shape is transmitted to the surrounding protein. After retinal has absorbed a photon and flipped to the extended, trans conformation, it is no longer sensitive to light. So, cells in the retina need to reset retinal to be ready for the next photon. This is difficult to do when it's buried inside opsin, so instead, the used retinal is clipped out of the protein and transported to neighboring cells. There, the enzyme retinoid isomerase, shown here from PDB entry 3fsn , converts the molecule back to the light-sensitive cis form, ready to be reinserted into opsin. The visual cycle has been studied in great detail using spectroscopic methods, and researchers have discovered that rhodopsin goes through many steps after it absorbs light. Some of these are very subtle: for instance, the change from cis to trans retinal is extremely fast, but the protein takes a bit more time to catch up, creating some observable intermediate states. The changes that lead to the nerve signal, however, are more significant. 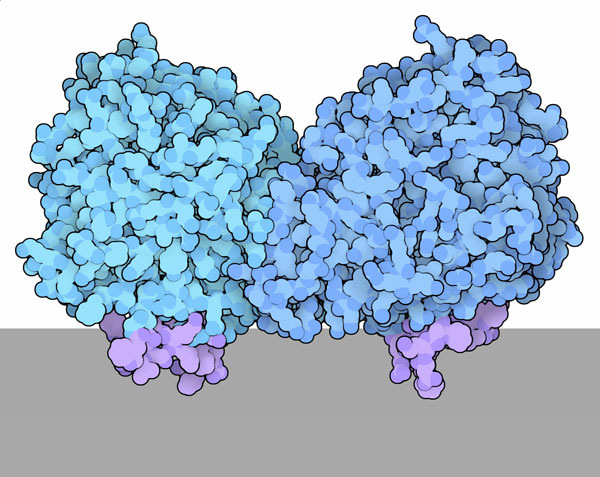 The two crystal structures shown here show two important steps: the first is rhodopsin before it absorbs light (PDB entry 1u19 ) and the second is after light has been absorbed and protein has shifted into the shape recognized by G-proteins (PDB entry 3pqr ). To look at these structures more detail, as well as the structure of opsin after retinal has been removed (PDB entry 3cap ), click on the image for an interactive Jmol. Many structures are available for intermediate states of rhodopsin in its visual cycle. tool to explore the motion of the protein as it moves through these states. Review of Biophysics 39, 309-328.